Tom Reilly is a local historian and has published several local history books on Cromwell and Drogheda. This book he claims is a long overdue evaluation of Cromwell’s campaign in Ireland and challenges all the conventional interpretations of events. According to the accepted version Cromwell was appointed Commissioner by the English Parliament to seek out and eliminate all Royalists and Catholic Confederates. In September 1649, he ordered the massacre of the Drogheda garrison and most of the civilian populace in a deliberate policy of terror, partly as a response to the governor’s refusal to surrender. A month later, the garrison and civilians of Wexford suffered a similar fate. These massacres have passed into resentful Irish folk memory. Reilly claims to reveal the untold story of Cromwell in Ireland, to acquit him of the ‘charges of wholesale and indiscriminate slaughter of the ordinary unarmed people of Ireland’ and to express ‘Cromwell’s compassionate policy towards Irish civilians’. Both the Cromwellian and the Interregnum period have been extensively researched and appraised by Irish and English historians since the appearance of Antonia Fraser’s Cromwell, Our Chief of Men (1973). However, according to Reilly the ‘period is left continually unrevised, the dubious traditional viewpoint is now generally accepted as authentic’ but he offers little evidence in support of this claim. The first hundred pages or so give a fair and reasonably accurate account of Cromwell’s early life and his campaign, including the sacking of Drogheda, from a variety of well-known sources. The Wexford, Munster and Clonmel campaigns are adequately covered and give a good balanced local history background. If the book had simply described the Cromwellian campaign in Ireland as a series of battles it would have provided a local history reference book on the Cromwellian campaign. However, it is written in an emotive, excitable style with irrelevant extraneous material. For example, did you know that Drogheda is the European headquarters of Coca-Cola and has a McDonnells? In the case of Wexford, he alleges that the recent 1798 bicentennial commemorations had a definite Irish republican slant. Where this book disappoints is in the two chapters on the assessment and analysis of the Cromwellian campaign in both Drogheda and Wexford. In the chapter ‘Drogheda—An Analysis’ the author dismisses both the eyewitness accounts, including that of Cromwell himself, and the contemporary accounts as Royalist propaganda or as having been written for ‘dishonest political reasons’. He contradicts what has been established by a large number of modern professional historians such as Michael Burke, Peter Gaunt, John Morrill, Antonia Fraser and others. For example, Cromwell justified the Drogheda massacre in which nearly 3,500 died as ‘that this is the righteous judgement of God upon these barbarous wretches who have imbrued their hands in so much innocent blood’. About 2,800 of these ‘wretches’ were Royalist soldiers which left between 500 to 700 civilians and clerics. It is Tom Reilly’s contention that only clerics and armed civilians died and that Cromwell honoured the military procedures of seventeenth-century siege warfare. He also maintains that ‘there is absolutely no evidence to substantiate the stories of the massacre…not those [words] transcribed years later which nationalist historians have so far relied upon’. Yet eyewitnesses record the fate of Drogheda’s garrison commander Aston who had his brains beaten out with his own wooden leg. His head and those of his officers were sent to Dublin on poles. Reilly makes reference to what happened in St Peter’s church and claims it as a part fabrication. In fact, according to Cromwell himself, a party of eighty sought refuge in the tower of the Protestant St Peter’s church and refused to surrender. He ordered that church furniture be piled up and set ablaze. Most died as they tried to escape. It is generally accepted that popular nineteenth century nationalist historians have distorted the accounts. For example, Fr Denis Murphy described tales of young virgins killed by soldiers, Jesuit priests pierced with stakes in the market place and children used as shields during the attack on St Peter’s. Reilly’s treatment of the massacre at Drogheda is disingenuous and he ignores the conclusion, long recognised by generations of historians, that Cromwell lost his self-control at Drogheda. When Cromwell landed near Dublin on 15 August 1649, he urged his New Model Army to execute ‘the great work against the barbarous and bloodthirsty Irish and the rest of their adherents and confederates’. There may have been good military reasons for behaving as he did, but they were not the motives which encouraged him at Drogheda, during the day and night of organised and approved butchery. Cromwell knew exactly what he was doing at Drogheda whether the order for ‘no quarter’ was given or not. Burke maintains that there was slaughter of civilians on a large scale to ensure that all the clergy were killed as Cromwell stated that there were ‘the satisfactory grounds for such action’. The historical evidence presented by Reilly is not convincing. He frequently refers to ‘respective partisan nationalist elements’ who are reluctant to accept ‘the rehabilitated version of Oliver Cromwell’ who was ‘merely one in a long line of English oppressors’. The author’s style is often superficial, volatile, tendentious and partisan in the face of known historical evidence. The book adds little to our understanding of the actions of Cromwell at Drogheda or at Wexford. His general thesis that Cromwell may well have had no moral right to take the lives at Drogheda or Wexford ‘but he certainly had the law firmly on his side’ does not stand up to examination. 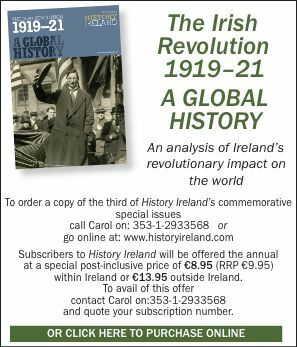 There is a need for a new book on the Irish Cromwellian campaign but unfortunately but this is not it.